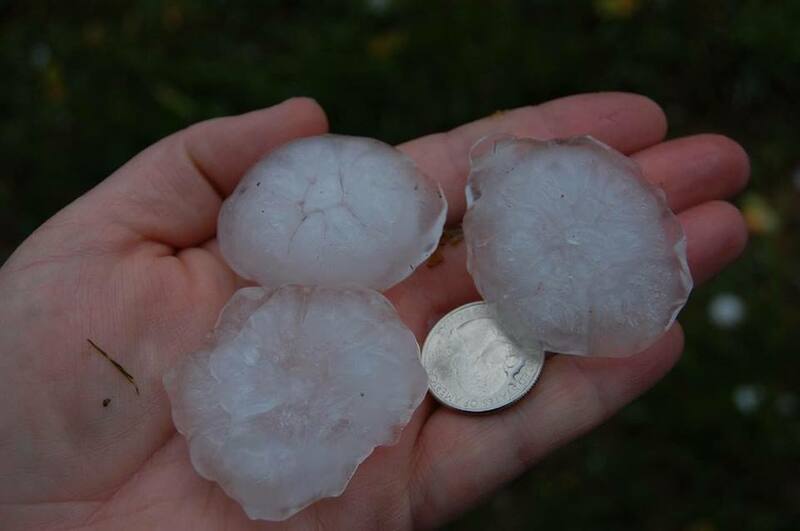 Photo Courtesy of Tiffany Spencer : Tiffany shows us what size hail that fell on Davis Creek Road just north of Lovingston looked like in comparison to a quarter. This was Monday afternoon, May 2, 2016. Severe thunderstorms moved across the Blue Ridge area lat Monday afternoon dropping hail from the size of to larger than quarters. On Route 6 River Road in Nelson County, heavy rains along with hail stripped leaves from many trees. Above, Jon Goff grabbed this video of hail falling late Monday afternoon near Lovingston. Tommy says there’s continued chances for showers and storms on Tuesday and later this week, but they don’t appear to be severe. Temps will be below normal for the second half of the week.